As Eurocode EC8 becomes more widely used, more third party checking of proposed designs is increasingly being required. In addition, with the greater use of viscous dampers to protect structures where seismic activity is prevalent, accurate FE modelling of the effects of seismic activity on these particular types of damped structures is essential. 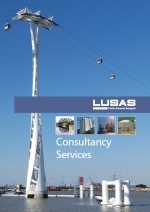 LUSAS Consultancy Services has many years of experience in checking work of this nature and has recently completed a seismic design check for a prestressed reinforced concrete, seismically damped road bridge in the Mediterranean region. The 1108m long, multi-span bridge comprises a straight and a curved section, and has an expansion joint midway along its length. In LUSAS, engineering thick beam elements modelled the reinforced concrete deck, and these were defined at the respective centroid of each component. Joint elements modelled the elastomeric bearings and seismic dampers. Connection between deck and elastomeric bearings and between the top of the piers and elastomeric bearings was made using nominally stiff members of negligible mass. These represented rigid links between the centroids of components and were defined with negligible mass so as not to contribute to the dynamic behaviour of the bridge. Two longitudinal dampers were located at the 1st abutment and transverse dampers, located at every 3rd pier along the bridge, required an additional stiff member arrangement as shown in the enlarged view. Geometric properties of all bridge components were calculated using the LUSAS arbitrary section property calculator. Eigenvalue analyses on both bridge structures found that 225 structural modes were required to meet the 95% mass participation factor value prior to carrying out a subsequent spectral response analyses using EC8 design spectra. Three nonlinear transient dynamic analyses were performed on each bridge using combinations of acceleration time-history dataset pairs in the longitudinal and transverse directions, as used by the bridge designers. Good correlation of results was achieved for both the spectral response and transient dynamics analyses, verifying the modelling techniques used by the original designers and the viscous damping techniques used in LUSAS.